In just three decades the Bass Anglers Sportsman Society has elevated the sport of tournament fishing to major league status. To celebrate it’s first thirty years, B.A.S.S.® asked well-known artist Dempsey Essick of Welcome, North Carolina to create a special anniversary painting. Essick responded with a magnificent and nostalgic painting which he called “The B.A.S.S.® Corner”. 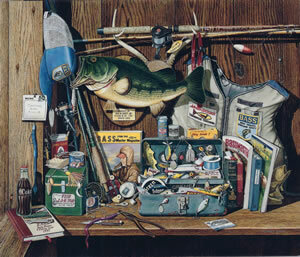 The painting portrays a catchall shelf that might be found in any angler’s home. In the garage perhaps, a place for his tackle box and enough room left over to repair a reel or tie a fly. And, maybe, a little space for those older pieces too precious to throw out. 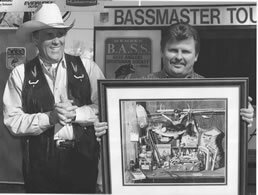 For a focal point, and to represent the beginnings of B.A.S.S.®, Essick used a mounted bass that Ray Scot caught in 1966, about the time that Ray started raising money to promote his first tournament. Hanging from the trophy’s lip is the lure Stan Sloan used to win the very Bassmaster Tournament in 1967. On the rack of antlers is the rod, reel and lure used by Essick’s good friend David Fritts to win the 1993 Classic Championship. In the mix of old and new there is a copy of the first Bassmaster magazine and, close by, a Lowrance Fish Finder from the 1960’s. On the fish finder, alongside the fisherman’s basic food of Vienna sausage and crackers, is Mark Menendes’ spinner bait from the 1997 Megabucks event. In the tackle box lid is a yellow whistle shaped like a lure. The whistle carries Brian Kerchal’s name, in memory of his habit of blowing a whistle each time he caught a bass. Bryan was tragically killed in an air crash after winning the 1994 Classic at High Rock Lake, NC, not far from Dempsey Essick’s home. Viewers tend to get up close to an Essick painting in order to appreciate the depth and subtle detail of a master watercolorist’s work. Fishermen, as their eyes sweep diagonally from the cap in the upper left to the lower right where Essick’s sculptured bookend completes the picture, will find themselves smiling as the painting evokes memories of a glass-smooth inlet early in the morning and the quiet splash of a lure dropping beside an old stump. B.A.S.S.® founder Ray Scott said a recent interview, “A beckoning to the water is in the soul of all men.” Ray was talking about a spiritual beckoning. Dempsey Essick’s “The B.A.S.S.® Corner” is, in the final analysis, a visual beckoning.